Thanks for the Coffee Break! Pictured bloggers, left to right: Nick Kasprak, Mark Robyn, Alex Raut, Scott Hodge, Joseph Henchman, Laura Lieberman, Kevin Duncan, Will McBride, Scott Drenkard, Jordan King. In response to those valid concerns, we hereby present our loyal readers and contributors with visual evidence that our bloggers do, if fact, end up getting treated to coffee. 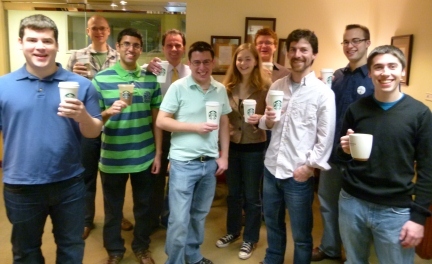 Thanks also to our friends at Starbucks, the preferred coffee provider of Tax Policy Blog contributors.